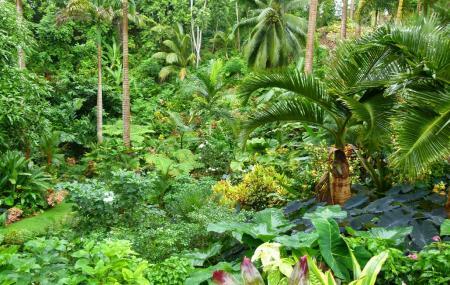 A private garden owned by Anthony Hunte (legendary horticulturist), the Hunte’s Garden is located around 6 kilometres from Bathsheba. Don’t be thrown off by the fact that it is a private garden. It is huge enough, dense enough and intimidating enough to be lost in! And it is definitely worth a visit! Many visitors find a trip to the garden to be a spiritual and calming one. Anthony is very friendly and he might even share a glass or two of fresh juice or rum punch with you! Along with his knowledge of the plants ofcourse. Entry is either Barbados $30 or US $15. Hiring a taxi or renting a car is recommended. How popular is Hunte's Garden? People normally club together St. John's Church and Harrison's Cave while planning their visit to Hunte's Garden. Wonderful place to visit on a sunny or a rainy day. So much beauty to see! Mr Hunt is so passionate about all his plants and takes the time to greet and talk to you. To top it all: we saw a humming bird's nest! Entry is 30 BB$ per adult, 15 per child. A great garden to explore, although a little bit small. Nevertheless, remains a good attraction to go if you like gardens. Limited parking space. A bit pricey for entrance fee. A refreshing relaxing experience. I thought the garden was rustic and beautiful. The various rest areas in the garden were charming allowing you some personal place to sit relax and enjoy. The interaction with the owner was quite refreshing and accomdating. It was an easy relaxing enjoyable day. Amazing botanical garden. We went here with the little one today and had a fantastic time. Beautiful garden, delicious cake and lemonade and Mr Hunte himself made us very welcome with information about the place. Would highly recommend. Best place to visit in Barbados. Absolutely beautiful and reasonable price. Couldn't stop taking photos. Anthony the owner is charming and generous with his time. Recommended.